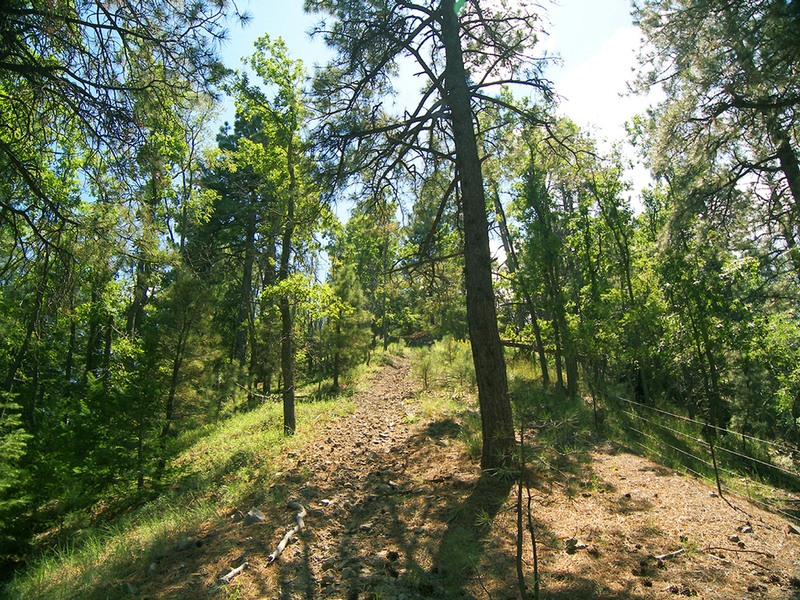 This loop hike in the upper Pinal Mountains makes use of an old utility line road, the Telephone Trail, and the Sixshooter Trail. The utility line road (which is really more of a trail), marks the route of an underground phone and power line. 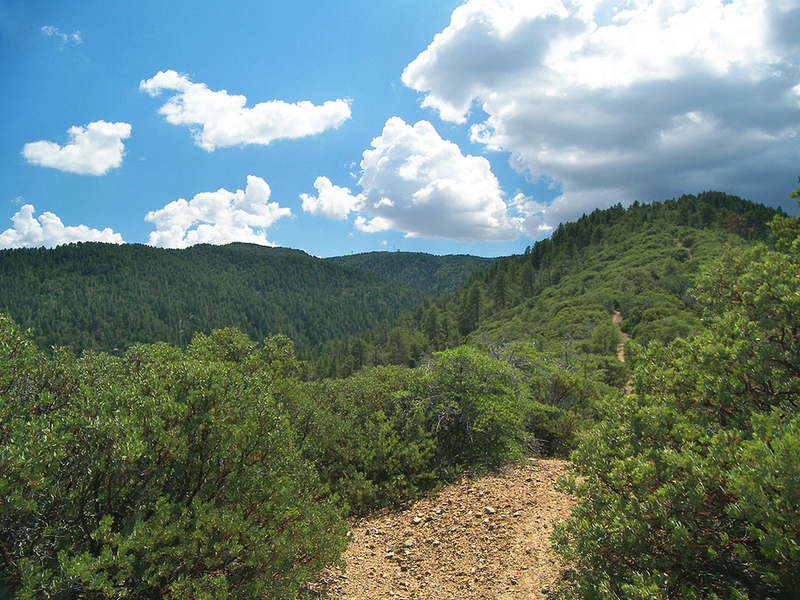 With a minimum elevation of 6400 feet and plentiful shade, this loop makes a good summer hike. Good boots are helpful for the numerous steep and rocky sections. Although we did this hike clockwise, this description is of a counter-clockwise loop. The hike will be easier to complete if you do it counter-clockwise, due to the Telephone Trail being poorly marked where it departs the eastern side of Telephone Ridge. If you want to do this hike clockwise, it would be wise to bring a gps unit. Starting at the Ferndell Trailhead, walk past the vehicle barrier gate at the beginning of the Ferndell Trail #204. You'll immediately come to the signed junction with the Sixshooter Trail #197. Turn left and head downhill on Sixshooter. After 0.15 miles, the Sixshooter Trail passes through a gate and joins up with an old road. Turn left and head downhill again. 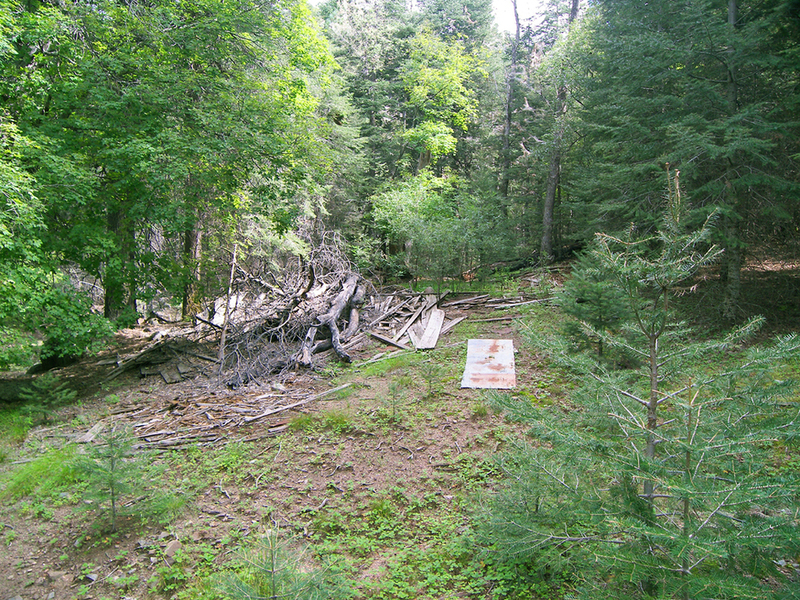 This abandoned road, which is now the Sixshooter Trail, makes a steep drop into the densely forested depths of Sixshooter Canyon. Around 0.9 miles, the steep descent eases up, and the Sixshooter Trail meets up with the Telephone Trail #192, at a signed junction, in a little flat area in the canyon bottom. Follow the Telephone Trail, and you'll soon come to a clearing on the left. A pile of rotted timbers and a scattering of rusty nails mark the site of a sawmill that was once located here. 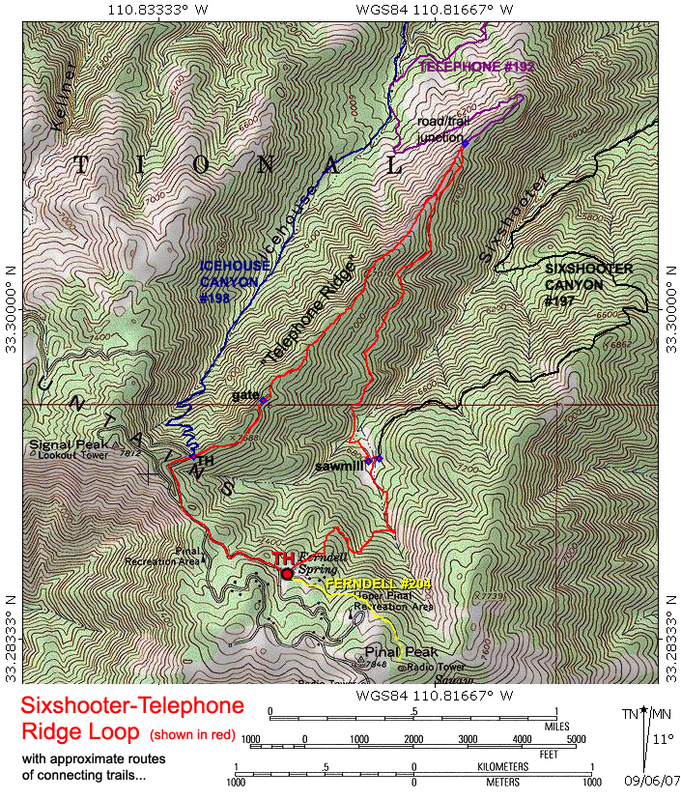 After crossing a side drainage of Sixshooter Creek, the Telephone Trail begins a long traverse of the forested western wall of Sixshooter Canyon. The trail descends gradually as it works its way northeastward. Interestingly, this section of the Telephone Trail was a road at one time. Perhaps lumber from the sawmill was shipped down to Globe via this route. 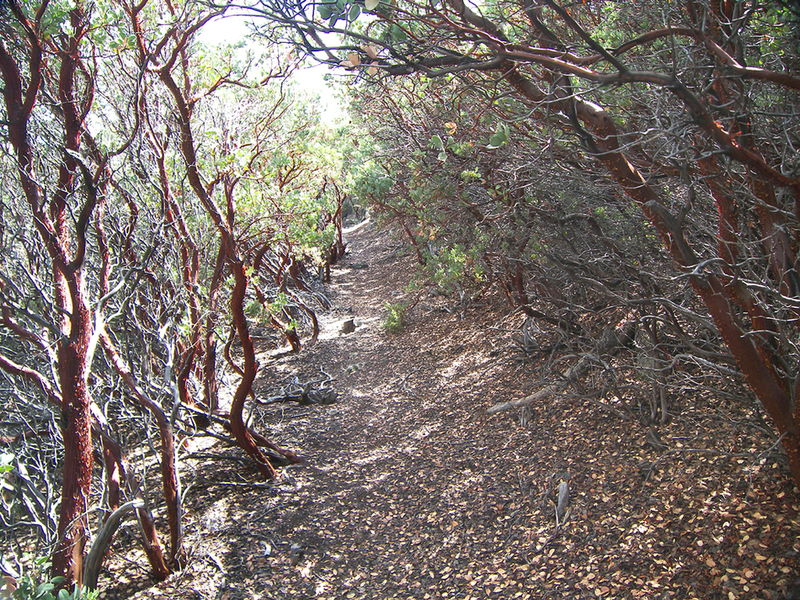 Beautiful fir forest gradually gives way to massive manzanita, as the Telephone Trail nears the spine of Telephone Ridge. Around the 6400 foot contour, the Telephone Trail suddenly emerges from a trench that was chopped through giant manzanita bushes, and lands on the ridge top, where it meets the utility line road. This junction's gps coordinates are: 33.30840 N, -110.81488 W. From this point, the Telephone Trail heads northeast along the top of the ridge, while sharing its route with the underground utility line. To continue on this hike, though, leave the Telephone Trail behind and begin following the utility line road (trail) southwest, as it climbs straight up Telephone Ridge. 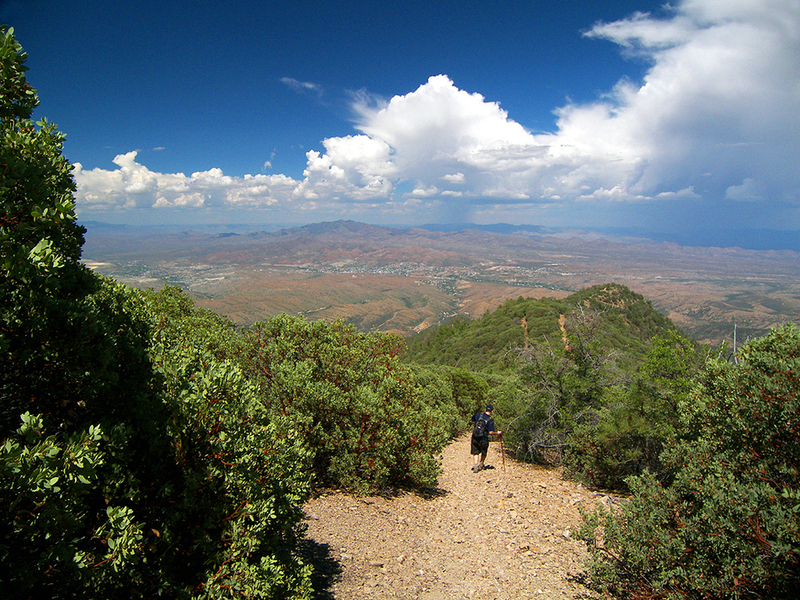 As you climb up the steep, exposed, manzanita lined ridge, be sure to turn around and check out the sweet panoramic views of the Globe area and eastern Arizona. Once you hit the 7000 foot level, the forest closes in and the views disappear. The ascent is a little less brutal now, and shade from the pine-fir forest offers relief. A couple of small campsites are passed, before the utility line road/trail comes to a locked vehicle barrier gate (not that a sane person would take their vehicle down this treacherous pseudo-road, anyway). The utility line road now becomes forest road 651M. Follow road 651M for another 0.37 miles, until it dumps you back onto forest road 651, at the start of the Icehouse Canyon Trail. Turn left and follow forest road 651 for 0.4 miles to where the road forks. A sign indicates Ferndell or Pinal Peak. Take the left fork (road 651C) towards Ferndell. After a third of a mile hike down road 651C, there is a sign indicating trails 204 and 197. Turn left at the sign, and you'll arrive back at the Ferndell Trailhead where you started.